A testament to Russians' love for Georgian food is how many recipes from that country are included in the Book. Last year I went on a trip to Georgia, loved the country and the food, and later wrote about it and one of my favorite dishes – lobiani. Now, my husband and I have moved to Georgia’s capital, Tbilisi. I am very excited about this opportunity — not just about getting much closer to khachapuri, but also about getting a chance to see a different perspective about food in the Soviet era. Georgian food is famous in Moscow and has been since Soviet times, which is why a few Georgian recipes appear in the Book. There are Georgian restaurants almost on every corner in Moscow, and it’s common knowledge that Georgians have it really nice tomatoes, meat, dairy and wine. We always sigh as we think about it in Moscow, as we’re cutting up our tomatoes wondering if they were actually made of plastic. Sure, you can get really nice stuff in the Russian capital, too, but it’ll cost you. In the few days here I’ve been here, I've discovered a number of fruit and vegetable stalls selling beautiful produce, a locally-stocked dairy shop and a butcher, where the guys in charge of chicken will be back “in a couple of days.” They’re either on vacation or away getting the meat – I couldn’t quite understand which it was. Oh, and I also discovered a Carrefour supermarket where you can buy absolutely anything and everything – including the European cheeses Muscovites have been deprived of for almost a year thanks to the food sanctions. I felt like a Soviet citizen who saw a well-stocked shop for the first time – my head was spinning and I wanted to buy everything! I told my grandmother by Skype and she just laughed. It’s a shame that the chicken guys are away as I chose to make chachkokhbili this week. It’s a chicken stew made with amazing Georgian spices (they’re all amazing) that goes really well with khachapuri – but then again, what doesn’t? I had to resort to a fancy looking butcher named “Chop Shop” to get the chicken, and although I had my doubts about how authentic the recipe would be, it turned out beautifully - mainly because all the produce was very fresh, and the local chicken tasted amazing. The recipe called for some red wine, and I added some from the 2 liter bottle of homemade wine our landlord gave us when we moved in. Presenting people with homemade wine is the Georgian equivalent of Russians’ “would you like some of my borscht”? I am yet to find a Georgian grandmother to interrogate about the food and life in the Soviet times, but so far the lady who did my manicure, Dahli, (she didn’t look a day older than 60 to me, but said she’s a great-grandmother!) told me there was lots of food available in the Soviet times. With land as fertile as this, and so many people growing their own produce, I imagine they would have been doing alright – at least in the warm part of the year. Dahli also said the Soviet times were better, but I don’t know – something tells me she hasn’t been to Carrefour yet! Take a whole chicken, cut into large pieces and fry in a shallow pan filled with hot oil. Then, put into a separate large pot or dutch oven with a lid and add chopped onion, pureed tomatoes, vinegar, wine, ½ cup broth, salt and pepper. Cover the pot and simmer for 1 ½ hours on low heat. Just before removing from heat, add sliced tomatoes. 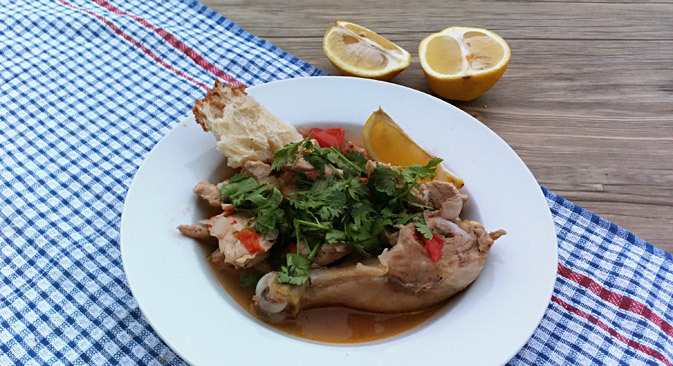 Cut up the chicken into pieces and serve each bowl with a piece of chicken, sliced tomatoes, lemon and herbs. It's also possible to make chachkokhbili with lamb in the same way, just slice the lamb into three or four pieces to serve.